AN UNSEEN STORY written by Queen Victoria at the age of ten is to be published for the first time this summer. Princess Victoria originally called her story ‘The School’, but then changed the title to ‘Alice’ – in honour of her lead protagonist. ‘The Adventures of Alice Laselles, by Alexandrina Victoria, aged 10 and ¾’ will be published on 8 June. It tells the story of Alice, a 12-year-old girl who is sent away to boarding school after her father remarries. 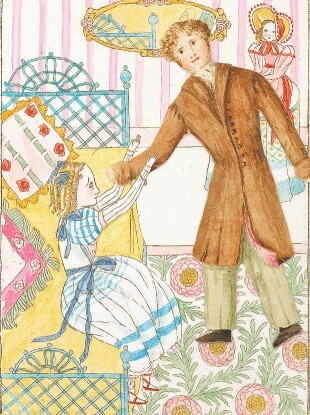 ‘Oh do not send me away dear Pappa’, exclaimed Alice Laselles, as she threw her arms around her Pappa’s neck; ‘don’t send me away, O let me stay with you.’ And she sobbed bitterly. Victoria’s story comes to its climax when Alice Laselles is wrongly accused of allowing a cat into the school without permission. That’s pretty dramatic stuff for a 10-year-old. The book includes illustrations produced by combining digitally manipulated copies of the paper dolls made by Princess Victoria and her governess, Baroness Louise Lehzen, and 21st century etchings. Victoria was born at Kensington Palace in London on 24 May 1819. She was the only daughter of Edward, Duke of Kent, fourth son of George III. Her father died shortly after her birth and she became heir to the throne because the three uncles who were ahead of her in succession – George IV, Frederick Duke of York, and William IV – had no legitimate children who survived. She had nine children with her husband Prince Albert between 1840 and 1857, most of whom married into other European royal families. She reigned from 1837 until her death in 1901. Quiz: Which Beloved Children’s Book Character Are You? Email “Queen Victoria wrote this book when she was 10 years old”. Feedback on “Queen Victoria wrote this book when she was 10 years old”.